This is one of our favorite Cape Cod designs, among a range of brilliant designs. The pale blue conjures up images of a gentle, calm and inviting sea. Best of all the Chips graphic (which has presumably been photo-enhanced), makes you think someone has sat with a pin ensuring every little hole has been dug out individually to make sure all the filled holes are empty. Good stuff. These Chips had a crunch, but it was a particularly thick Chip, and the design made it a little like biting into food. The Snap Test worked; the Chip broke in half without splinters flying everywhere, but it made more of a bass sound rather than a loud echoing snap. Firstly, most of these Chips were whole, almost all were thick and flat. Although there were some curled ones. The surface area was a little like a rippled Chip had been cut twice; both ways. An alternative view is that it is a gimmicky Chip like the shapes that are marketed to kids. Our opinion is not relevant, so we will mark it among its peers of this shape. 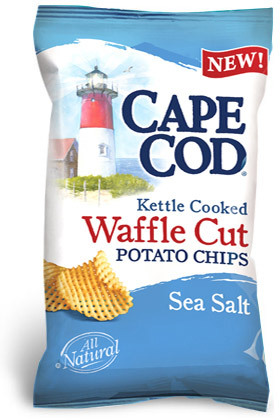 A warm and rich potato aroma was followed by a mild salty Chip flavor. With just the Canola Oil added to the salt and potato it was always likely to be fairly plain, with all the excitement reserved for the design of the Chip itself.